We get you out there – everywhere. Promised! Whether hospital relocation or repatriation, within just one hour we have a full medical team available for your needs. Our aircraft are equipped with the latest and most modern medical requirements for intensive care transports. Together with emergency doctors and qualified emergency paramedics there are two experienced pilots only for you to relocate or retrieve patients within Germany or from abroad, quickly and easily – when every second counts. Our 24 hour hotline controls and coordinates the entire process of your ambulance flight. Aerowest is commissioned and authorized to the implementation of patient transport of all national transfer flights via the national health insurance by the state of Lower Saxony. Thus, the patient occur during a medically necessary relocation flight no additional costs. Depending on the aircraft type we can take up to three relatives aswell. Due to the flight characteristics of the aircraft patients can be relocated quickly and gently in a short time over long distances. Here we are almost independent of the weather and ready around the clock. 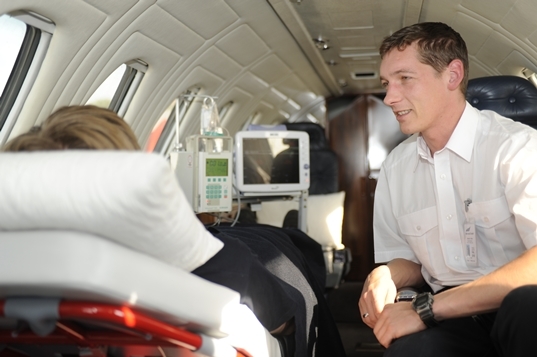 Years of experience in the field of Air Ambulance will ensure a smooth and service-oriented workflow.